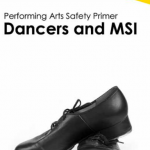 Actsafe shines the Spotlight on Jenny Duffy, Dance Educator and Choreographer for the B.C. Lion’s Dance Team, The Felions. The benefits of good nutrition are numerous, and even more so for dancers. 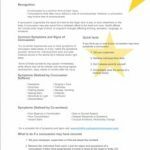 This information booklet answers questions such as; how can I sustain my energy longer? How can I improve my recovery with nutrition? How can I prevent muscle soreness? And includes guidance and nutritious recipes. Kerry Goulet speaks to UBCP Stunt Performers regarding the dangers of incurring a concussion while working in the motion picture, television, performing arts and live events industries. 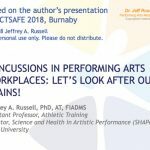 This concussion in performing arts slideshow was presented at the 2018 Actsafe event Safety Conference by Dr. Jeffrey Russell of Ohio University. Keep up to date with health and safety news in BC's Motion Picture, Television, Live Event and Performing Arts industries. Monday – Friday 9am – 5pm.